UTMB is a monster of a course covering three countries in its 170km. It starts in Chamonix, France heads into Italy and then Switzerland before crossing the border once again to return to France and the screaming crowds lining the Chamonix streets. 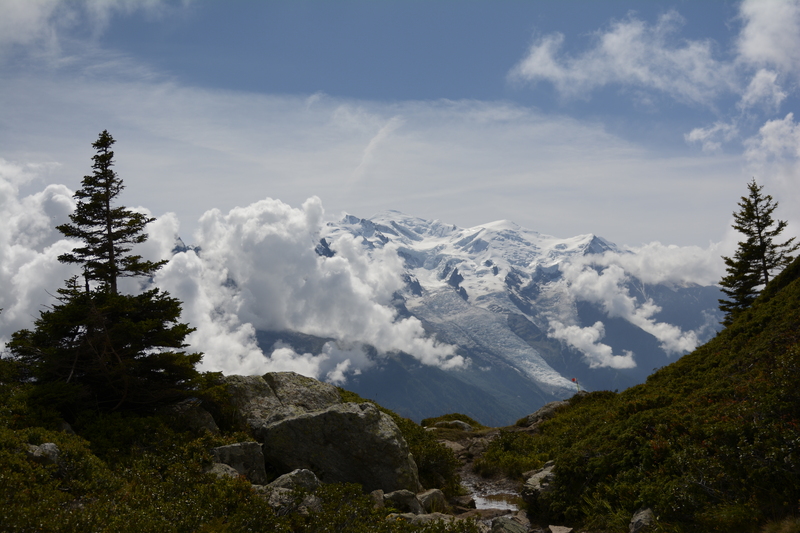 Chamonix gets all the plaudits but Courmayeur in Italy plays an important role in UTMB. It’s a pleasant mountain town in the Aosta Valley at the base of Mont Blanc. It’s also the start for CCC and is the first major place on the UTMB course where runners can pick up a drop bag and take on substantial fuel. 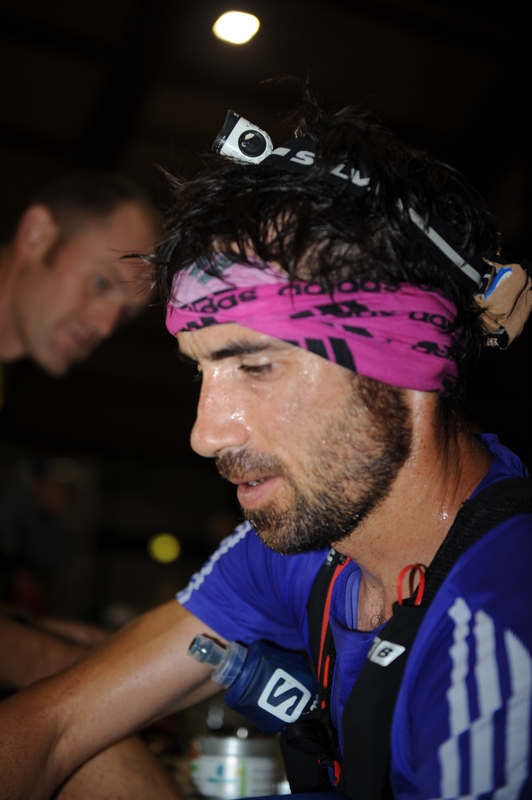 The UTMB start time is 6pm and by the time the elite runners reach Courmayeur at 78km it’s around 2:43am. The aid station is in the large Sports Center. Food, drink and the all-important drop bags have been laid out awaiting the runners. The station stays open until 1pm the next day, and the volunteers will be in for a long night and day. The café in the aid station is doing a roaring trade selling espressos and beer. There are some late night revellers, lots of media and the elite runners crews. Their pitstop is not too different from that of a Formula 1 team, and just like in F1, there are differing processes. There is an air of anticipation. Everyone has been waiting for a long time, we are all high on espressos. Then cheering announces the arrival of the lead group. There are four runners and each of their crews is ready for action. The runners head in to the building and are guided up two flights of stairs. Their sweat is dripping. It’s a mild night out there, and they have been moving at a good pace. 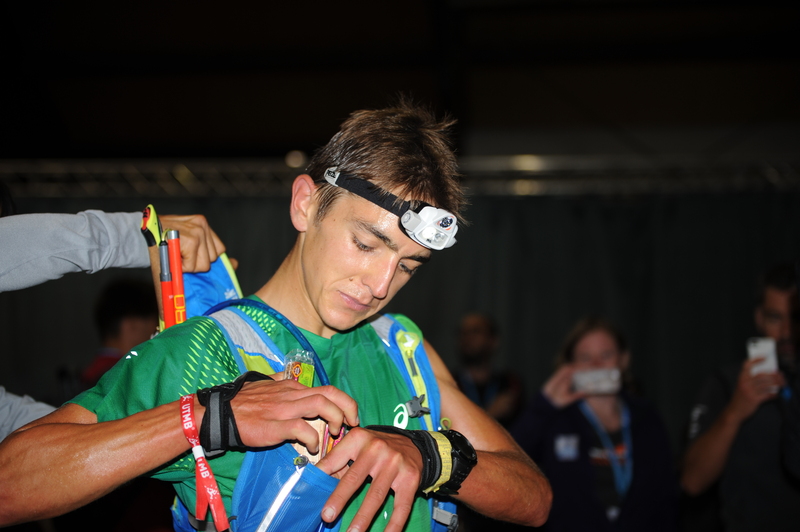 The iRunFar crew has already recorded and snapped the arrival. Other media and photographers charge around the airy hall to see each of the four runners and their crew, taking photos, filming, and trying to find out any snippets of info and observe how they feel and what they are eating and drinking. Practised crews replace water bottles and load up with new gels while the runner quickly drinks and eats, whilst also looking out the corner of their eye at the other three runners. Thevenard is first to start to leave and there is a sudden rush of activity from the others. Each of them doesn’t want to lose seconds or minutes but they are also acutely aware that they must take on vital fuel otherwise their race could end. It’s a fine line. Quickly, the four are gone and the crews are packing up. They must head to the next aid station. It’s been less than five minutes of frantic activity and we all return to a sense of calm and anticipation until the next arrival. This article appeared in the November edition of Ultra Running Magazine. Get your subscription here. This entry was posted in Ian Campbell Adventures, Uncategorized, UTMB and tagged CCC, Ultra running, Ultra Running Magazine, Ultra Trail World Tour, Ultramarathon, UTMB, UTWT on November 17, 2015 by Ian Campbell. 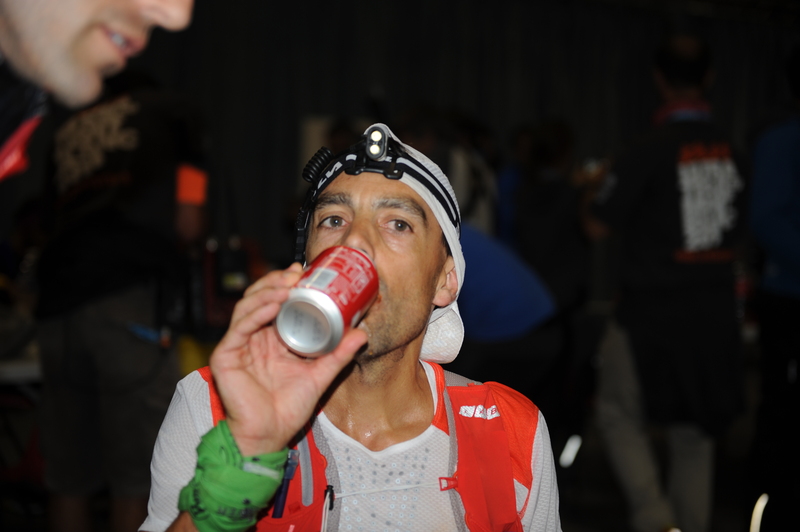 This entry was posted in Lavaredo, Uncategorized and tagged Didrik Hermansen, irunfar, Lavaredo Ultra Trail, The North Face Lavaredo Ultra Trail, Ultra Trail World Tour, Ultramarathon, UTWT on July 1, 2015 by Ian Campbell. The Ultra Trail du Mont Blanc organisation announced today that Columbia Sportswear Company are now involved as a partner of UTMB. 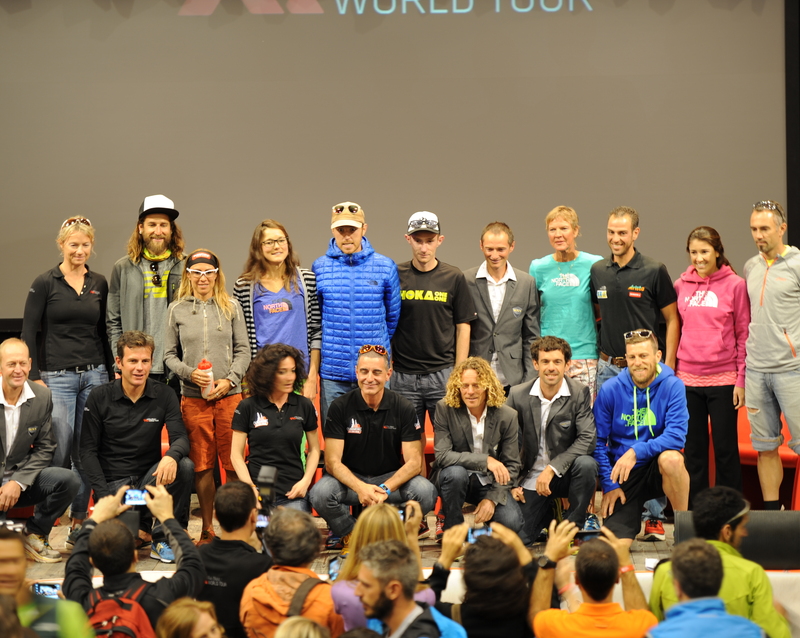 It was also announced that The North Face will cease their involvement with UTMB after 12 successful years. The full press announcement from UTMB is below. 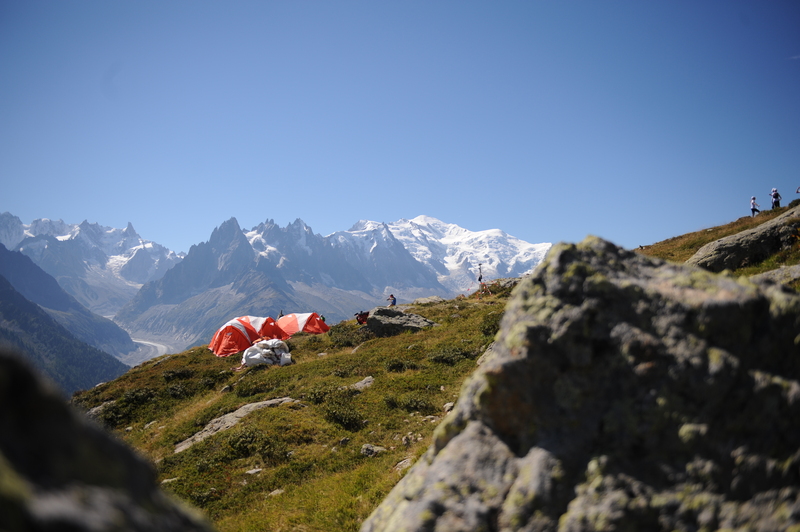 Source – UTMB organisation press release. This entry was posted in UTMB and tagged Columbia, Columbia Sportswear, Montrail, Mountain Hardware, The North Face, Ultra running, Ultra Trail World Tour, Ultramarathon, UTMB, UTWT on November 12, 2014 by Ian Campbell. A great film from Billy Yang about an American runner Sally McRae who finished 10th at WS100 this year. A really well put together film charting the story of Sally McRae. Emotional and moving at many times its worth watching. A fantastic sound track accompanies the film. This entry was posted in Ian Campbell Adventures and tagged Billy Yang, Sally McRae, Ultra running, Ultra Trail World Tour, Ultramarathon, Western States, Western States 100, WSER on November 12, 2014 by Ian Campbell. See the link to http://www.irunfar.com preview on The North Face – Lavaredo Ultra Trail. This entry was posted in Lavaredo, ULTRA, Uncategorized and tagged Anton Krupicka, Dave Mackey, Francecsa Canape, Lavaredo Ultra Trail, Mike Foote, Nerea Martinez Urruzola, Rory Bosio, The North Face, The North Face Lavaredo Ultra Trail, Ultra running, Ultra Trail World Tour, Ultramarathon, UTWT on June 25, 2014 by Ian Campbell. On the way to La Palma to cover Transvulcania. Spent the last seven hours (waiting for a ferry from Tenerife to La Palma) in great company with Richard Felton of Profeet. Its hot so looks like it going to be a scorcher for those running the race. The VK tomorrow at 1600 should be excellent. It will be great being on the VK course. Looking to get some great shots of the runners and spectacular scenery. This entry was posted in Transvulcania, ULTRA, Uncategorized and tagged Sky race, Skyrunning, Transvulcania, Ultra running, Ultra Trail World Tour, Ultramarathon, UTWT on May 7, 2014 by Ian Campbell.